Calling all basketball enthusiasts in Bicol! 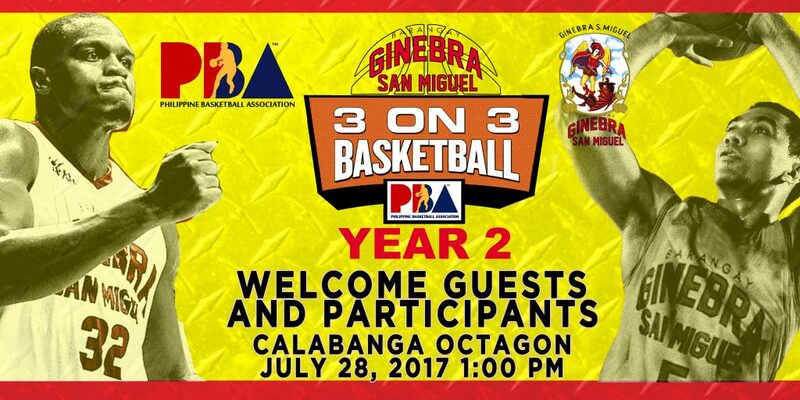 We are inviting you to be part of PBA Ginebra San Miguel 2017 3 on 3 Basketball Tournament on July 28, 2017, 1:00 PM at Calabanga Octagon. Get a chance to represent Bicol and play in the National 3 on 3 Championship Game! The National Champion Team will receive P50,000 in cash, GSMI products, GSMI trophy, free accommodation and meet and greet PBA Ginebra players. The event will be covered by CNN Philippines, TV5-PBA, Asenso Pinoy and SMC Media. The Regional Champion Team will receive P4,000, 1 case of GSMI products and will play in the National Championship Game. The runner up will also receive P3,000 and 1 case of GSMI products. For inquiries and registration, kindly contact Mr. Allan Rey Camata through the following phone numbers: 881-7778, 09156800862 and 09164052285. You may personally visit URBANA located at 32 Barlin St. Sta. Cruz, Naga City.